In a landscape of captivating vistas like the Amalfi Coast, there’s something special about Positano that speaks to the hearts of travellers. With its pastel-hued homes clinging to the mountains as they drop dramatically to the sea, it’s a seemingly impossible town, achingly beautiful, and distinctly its own. Even though I’ve lived just down the coastline in Amalfi for a decade, I am certainly not immune to Positano’s unique charms. 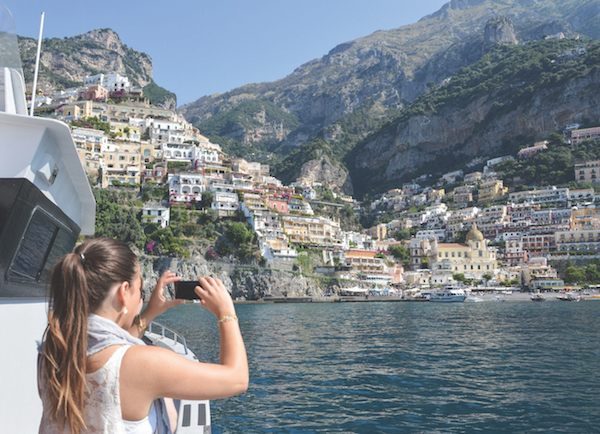 Every time I take the ferry to Positano, I’m right there at the window – side by side with first-time visitors – ready to catch that first glimpse in the distance. 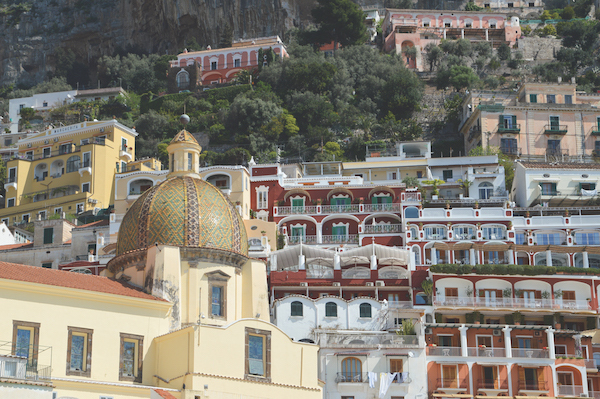 Even before arriving, Positano has a way of getting under your skin. When Steinbeck introduced Positano to the world in his 1953 essay for Harper’s Bazaar, he wrote: “Positano bites deep. It is a dream place that isn’t quite real when you are there and becomes beckoningly real after you have gone.” As the ferry approaches Positano, I think how Steinbeck nailed it. The town has an air of dreaminess about it that only adds to its appeal and popularity as a holiday destination. Once on shore, even I feel like I’m on vacation while strolling through town. Positano is the place to really soak up la dolce vita in one of Italy’s most enthralling settings. Positano spills down from Monte Sant’Angelo, which soars to just over 4,700 feet. Gazing up to the top I see the hamlets of Nocelle and Montepertuso nestled in the mountains. At the bottom of the valley, surrounded by houses seemingly stacked one on top of the other, the church of Santa Maria Assunta stands out with its geometrically patterned dome. Taking it all in from the beach, it’s easy to see why Positano is called the Vertical City. 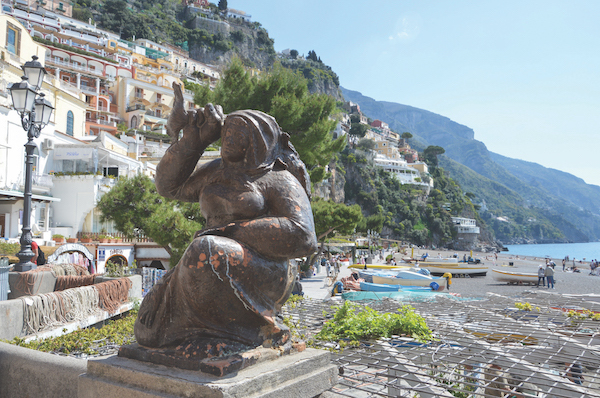 Travellers have been appreciating the landscape of Positano since ancient times. Traces dating back to the Mesolithic Age have been found in grottoes near Positano. It was the Greeks and later the Romans who left the first settlements here. The ruins of two Roman villas have been uncovered, one on the largest of the Li Galli Islands off the coast of Positano and the other directly below Santa Maria Assunta. Soon, modern day travellers will be able to get a glimpse of what Roman living in Positano was like when the excavated villa with its brilliant frescoes below the church opens to the public. Stepping into the cool nave of Santa Maria Assunta, the first impact is the brilliant white and gold Neoclassical design dating from the 18th century. I stop to admire the Byzantine icon above the altar – one of the town’s prize possessions. There are a host of local legends surrounding the painting, varying from Saracen pirates to miracles. One says that the painting was aboard a ship stranded off the coast of Positano when the sailors heard a voice calling out, “Posa, Posa!” (“Put me down, put me down.”) This is said to be the origin of Positano’s name. Every summer on Ferragosto, the August 15th holiday dedicated to the Assumption of the Virgin, the Positanesi recreate the arrival of their celebrated icon with an elaborate procession through town and along the beach. When the legend comes to life on a hot summer night, I can sympathize with the icon wanting to stay here forever. One of Positano’s most scenic commodities is its beaches. 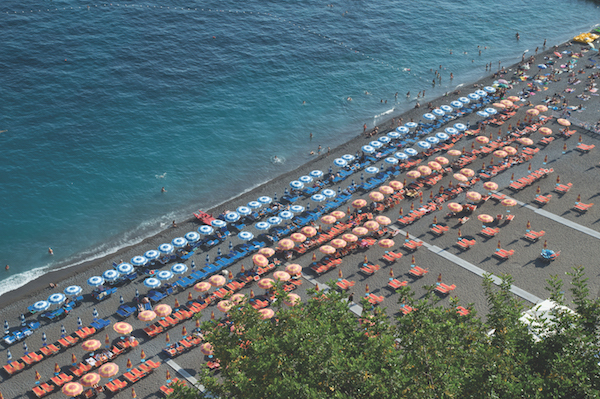 The heart of the town spreads out around Spiaggia Grande with its neatly lined up rows of umbrellas and sunbeds. During the summer, this beach is the hub of activity all day long, from the ferries coming and going at the town’s cement pier to the trendy Music on the Rocks nightclub carved into a cave. From the pier, I spot small motor boats sporting signs with the names of restaurants and beach establishments at tiny beaches like Arienzo and Laurito nearby. To truly get away from it, you can’t go wrong with a day at one of these tiny beaches tucked away in rocky coves. My destination is yet another beach in Positano, called Fornillo, which can be reached by a beautiful walk along Via Positanesi d’America. This pathway hugs the rugged coastline and overlooks the turquoise sea below. It’s named after the many Positanesi who emigrated to America in the mid-1800s when the town’s fortunes took a turn for the worse. With the scent of saltwater and pine trees mingling in the sun, it’s hard to imagine leaving this place behind. At the beach, I settle into a sunbed. Since beaches on the Amalfi Coast are rocky, renting a sunbed is always the most comfortable option. Gazing out to sea I spot the Li Galli Islands. Local lore says they were the home of the mythical sirens from Homer’s Odyssey. Listening to the waves tumbling pebbles to and fro, the song of the sirens still seems to linger in the air. Back in the centre of town, I spot a few artists at work painting local scenes, their easels set up right at the edge of the beach. It’s easy to be inspired in Positano. With its colourful collage of buildings dotted with bright bursts of bougainvillea all awash with sunshine, the town itself seems like a painting that has come to life. Very fitting for a town that has been a haven for artists since the late 1800s. The artistic community that developed here was as ever-changing as the artists passing through. Some stayed for a short time, like Picasso and MC Escher, while others took up residence. There was a strong Russian presence, including the ballet dancer and choreographer Léonide Massine, who bought the Li Galli Islands in 1924. His home was later purchased by Rudolf Nureyev, another of Russia’s great ballet dancers. Positano celebrates its connection with ballet with the “Positano Premia la Danza Léonide Massine,” an annual event in September that keeps the spirit of dance alive. Around every corner, I spot boutiques overflowing with clothing in Positano’s iconic style. La moda Positano, or Positano fashion, is an art form in itself – and no less colourful than the town’s artistic past. In a place of creative freedom and invention, it’s no surprise that fashion followed new directions here. In the 1950s and 1960s, Positano’s local style of free-flowing linen, brilliantly hued fabrics, and relaxed chic look was much loved by jet set travellers like Jacqueline Kennedy. 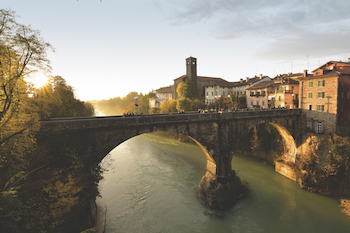 Today’s travellers will find plenty of tempting choices while meandering through town. 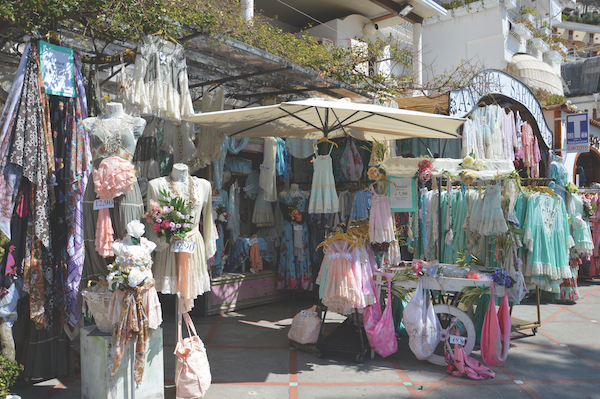 Boutique Luisa is one Positano’s shops where the history of la moda Positano is woven into the fabric of their designs. The store is named after Luisa, who in the ’60s was a model for some of Positano’s first fashion designers. Eventually she turned her hand to design and opened a boutique of her own with a studio and factory where local artisans crafted each piece utilizing handmade lace and traditional fabrics. When I stop by to see the latest designs, they always transport me to summer, regardless of the season. I see delicate white lace dresses, patterns that recall the ceramic tradition in Vietri sul Mare, and colours inspired by the Amalfi Coast itself. Here tradition is a family affair. While Luisa is still occasionally involved with design, her children are following in her footsteps with Boutique Luisa, and they’ve even expanded abroad. From Miami to Dubai, la moda Positano is now sought after around the world. With its beaches and idyllic atmosphere, Positano is above all a town made for relaxation. Two days is plenty to explore the town’s many charms. If you’re staying longer, it’s also a convenient base for day trips to nearby Amalfi Coast towns like Amalfi and Ravello; the former being a 30-minute ferry ride and the latter accessible from Amalfi by bus or taxi. Capri and Sorrento can both be reached by ferry as well, which is by far the most comfortable way to explore the Amalfi Coast area. Do keep in mind that ferries only run from around Easter through October, and that Positano is a very seasonal destination. During the winter months it’s a sleepy town, with many of the hotels, shops and restaurants closed. Yet even off-season there’s plenty to discover, especially with the maze of staircases and winding pathways to yourself. When it’s time to board the ferry back to Amalfi, it feels like my vacation has come to an end. Thinking back to Steinbeck’s words, for me it’s the timeless quality of Positano that makes it bite deep. It offers an escape, even if just for a couple of days, to an impossibly beautiful spot. Just beware when you visit that there’s no known cure for the Positano travel bug. One visit will always leave you longing for more. Fly to Naples. 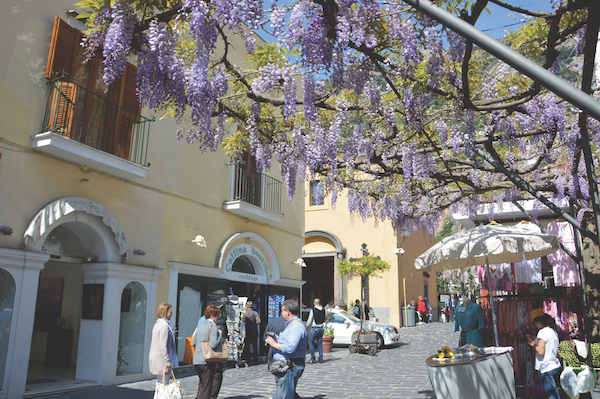 From there you can get a shuttle bus or a taxi to Sorrento. Either way, book ahead, outbound and return. The adventurer’s route would be a bus to Naples, a Circumvesuviana train to Sorrento and then a ferry to Positano.